Bangkok is known for itâ€™s great street food so during our one-day stop we decided explore what the city had to offer. First stop was the Taling Chan Floating Markets for lunch. The Taling Chan Floating Markets are a series of food stalls, eating areas and market places all situated on floating platforms or boats. Here we started out with some Thai Crispy Pancakes. These were small fried pancakes with either a sweet or a salty filling. We chose the salty filling which was made up of egg, coconut, prawn, parsley and whipped cream. The pancake had a nice crunch to it and the sweet and salty flavors played nicely off each other. The prawn aftertaste took some getting used to. Next up for lunch was a classic Pad Thai and chicken satay. Pad Thai is a popular Thai noodle dish and if you havenâ€™t had it before, rethink your life. It was pure sweet, nutty, awesomeness. Chicken satay are small seasoned chicken kabobs that come with a peanut dipping sauce. The chicken was good but my favorite part about this was the sauce. We donâ€™t have many nut-based sauces in the U.S so it was a surprising new find for me. For dinner, we were on Khaosan Road, also known as backpackersâ€™ road. 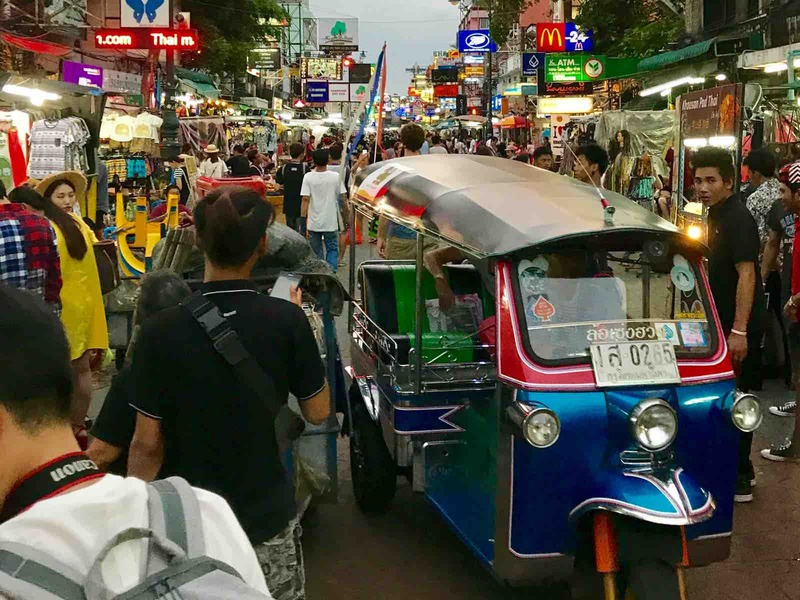 This is a bustling street full of food vendors, travelers, locals, and tuks tuks (motorized rickshaws). First we got some chicken roti wraps. These wraps had shaved, roasted rotisserie chicken with onions, carrots and a yogurt sauce. This was some much needed hearty food after a long day of touring Bangkok. To finish off the night we got some veggie spring rolls. The great thing about these was that they were fried right there on the spot when you ordered them. Delicious!